Welcome to the online home of Del’s Motorcycles and Tyre’s. We are a family run business who are now into our tenth season; our main goal is still to provide an exceptional service to all of our new bike enthusiasts, as well as maintaining a welcoming and reliable service for our existing customers. 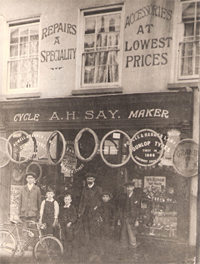 Our business is now into its 10 year, with bikes very much as a new project but bikes and motorcycles have been in our blood for years, upon opening up the workshop it re-ignited the love and passion for all things 2 wheeled (and in some cases 4 wheeled) dating back to the early 1910's, back then the Say family had a shop that was owned by Derek's Great Grandfather, who specialised in push bikes and the first engine induced push bikes. Through the years Derek has picked up a vast amount of experience participating in MotoX for the Cirencester Club in the early 1980's, then moving onto repair work for the Mid Wilt School Boy riders and then progressing onto Team Mechanic for a Vauxhall Caterham team during the early 1990's. The love for motorcycles is still very much alive in the family personally and professionally. Derek is still very much interested in pursuing the love the two wheeled loves in his life on and off road and will often be seen out on his bike especially on a Sunday. Just like there father all three of Derek’s children have interests one way or another with motorcycles and the next generation is now coming on board in the form of Derek’s two grandson’s and granddaughter. With being a family run business Derek believes that a friendly and welcoming environment for all ages is truly beneficial in supplying a quality piece of workmanship that anyone can be proud off. He specialises in Servicing, Repairs, Modifications, Diagnostics, Tuning and more importantly the knowledge to be able to advise on the best solution for the customer. Our business may still be evolving but our knowledge is unprecedented.